It's the Year of the Pig and what better way to celebrate the Chinese New Year (which begins February 5) than with a pork dish from one of the World's premier chefs, Chef Masaharu Morimoto. 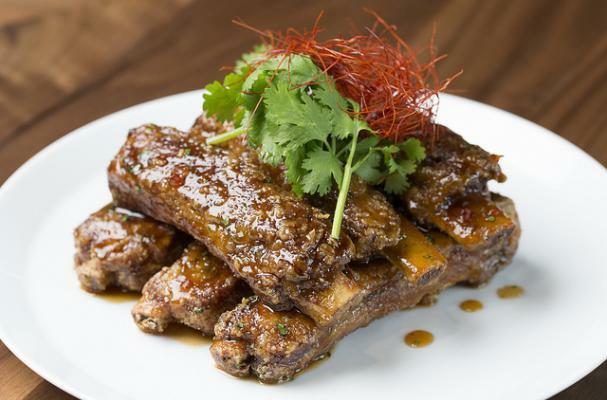 His Sticky Spare Ribs have become a favorite at his restaurant Morimoto Asia; one bite and you'll see why- they're crispy, tender, messy, salty, sticky, sweet. The ribs are first braised, then dunked in cornstarch and flash-fried, creating that crispy crust. Then, they're doused in a finger-licking good hoisin sweet-and-sour sauce. This is one recipe that's certainly worth the time and effort! Combine all ingredients from the Hoisin Chili Sauce list and fully mix with a whisk or a fork and reserve. The sauce can be made and kept overnight in the refrigerator. Place Pork Ribs in an oven proof pan. Place the ginger, garlic, white onion, cooking wine and oil into the pan. Cover with water and add the tamarind paste and gently stir the paste into the mixture. Cover with Aluminum foil and cook for approximately 3.5 hours at 250 degrees Fahrenheit or until the meat pulls away easily from the bone. Allow the ribs to cool in the braising liquid until able to handle easily. Once cooled slice the rack apart into individual ribs. Lightly coat each of the braised/cooled ribs in cornstarch and fry in oil at 350f until golden brown and crispy (about 2-3 minutes) and place on a wire rack to drain and cool slightly. Once drained and slightly cooled, toss the fried ribs with the Hoisin Chili Sauce and plate (3) to a serving. Top with the fresh chopped cilantro and serve immediately.